There are a few things that get me really, really excited when it comes to food. Well, actually…. 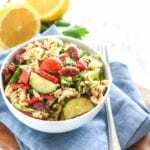 food is a topic that tends to get me very excited in general, but especially when it comes to whole, healthy food and spotting new trends. 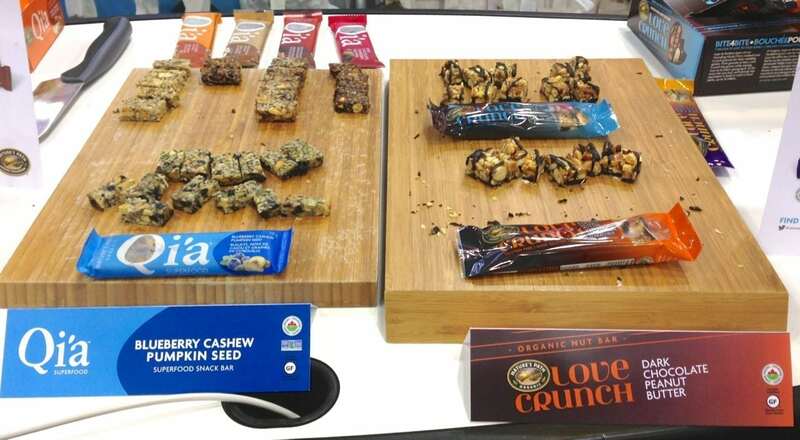 That’s exactly what I spent last Saturday doing at the CHFA West Tradeshow, an annual event organized by the Canadian Health Food Association. In case you haven’t heard of CHFA before, they’re Canada’s largest trade association dedicated to natural health and organic products. 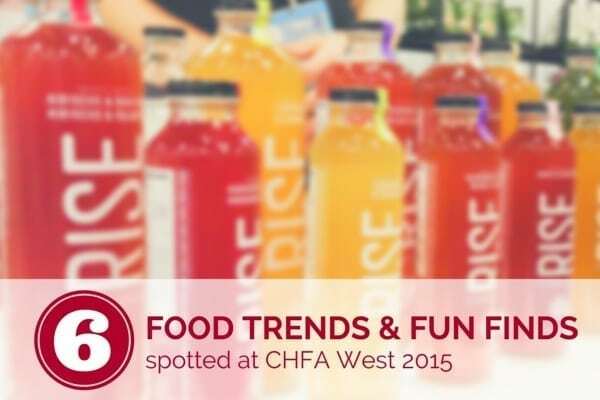 I attended CHFA East last fall when I was still living in Ontario – an amazing experience – and therefore was super pumped to check out CHFA West here in Vancouver. The Vancouver Convention Center is HUGE, and so were the number of exhibitors. 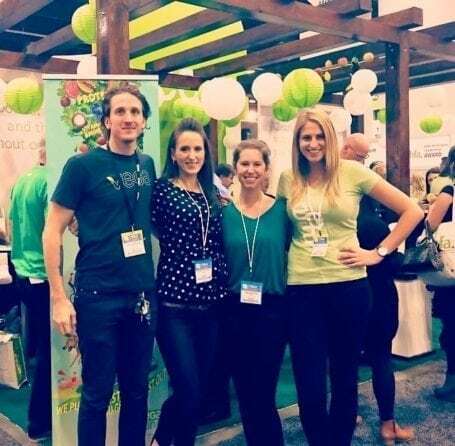 Everything from kale chips to natural skincare to organic pet food was under one roof last weekend, and to a foodie like me it was a bit like trick or treating, all while getting to know some great companies whose mission it is to help create a healthier population. If you’re a fan of trail mix, you’re probably also familiar with how addictive it can be. 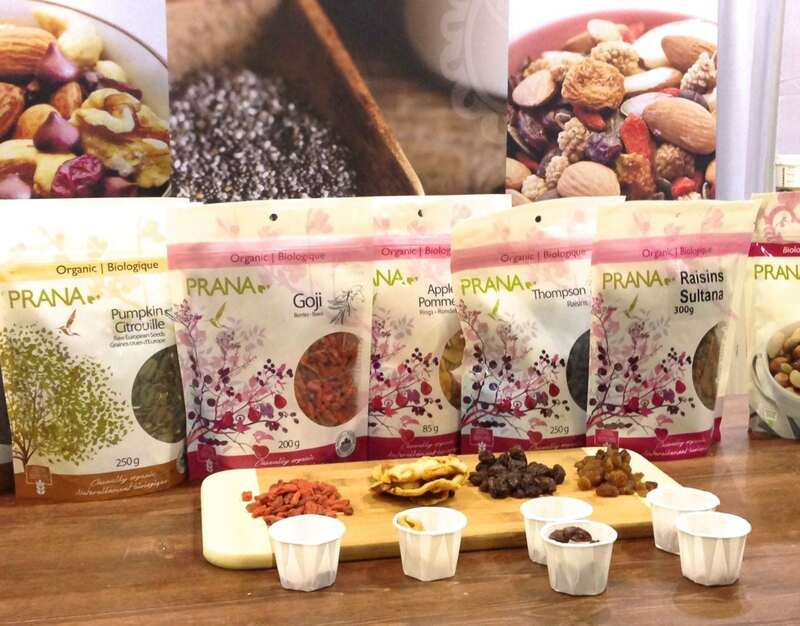 We know it’s great to eat various nuts and seeds for their healthy fats, vitamins and minerals, but some companies are taking this a step further and mixing their traditional ingredients (think almonds, brazil nuts and sunflower seeds) with more exotic, less conventional ones. Prana for example, had 2 blends available to sample: the Machu Pichu Mix (includes Incan goldenberries, white mulberries, Brazil nuts, goji berries, and European pumpkin seeds, among others) and the Kilimajaro mix (almonds, walnuts, salty cashews, Sultana raisins, naturally sweetened cranberries and chocolate chips). Those guys in the middle are Maca Maple Cashews, and friends, these things are like crack. 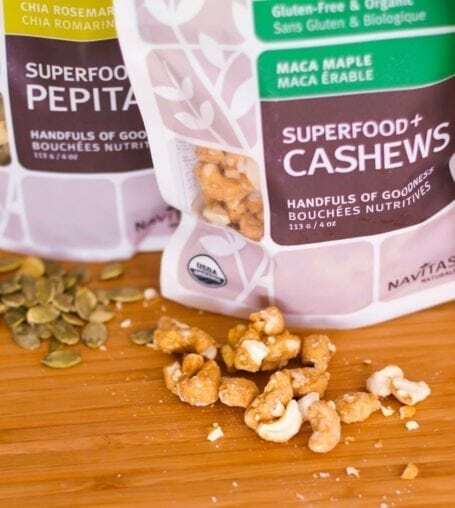 The nutty, slightly sweet taste and crunchy texture is addictive, and as a long-time maca lover they’re one of my new favourite products. The cashews are all clustered together inside the bag (making it hard to eat just one!) and I’m already finding ways to incorporate them into as many meals as possible. 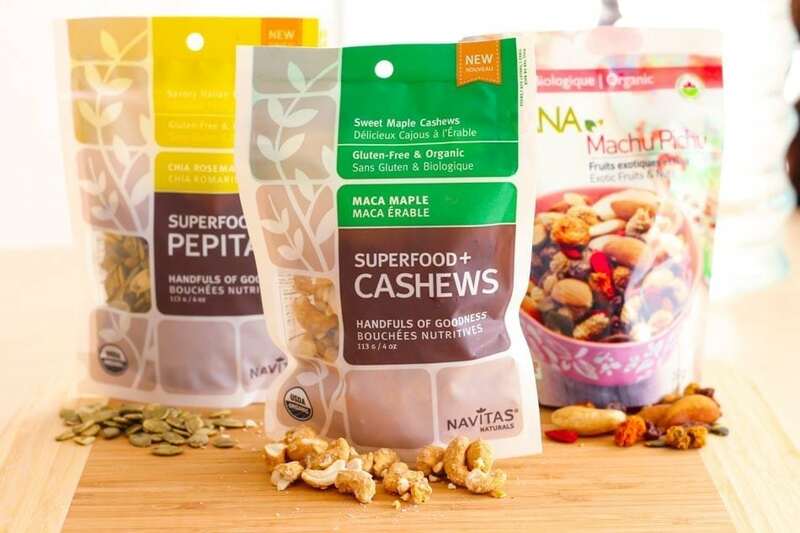 What’s cool about products like the maca cashews and Navitas Naturals’ Chia Rosemary Pepitas is that they create a new way for us to consume some of the ‘newer’ (and by that I mean new to the mass market) superfoods that previously we’d only really been throwing into smoothies. 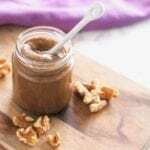 You wouldn’t normally just go eat a scoop of maca root powder out of a bag (at least I wouldn’t), and I like that these nut and seed mixes make these awesome nutrition boosters more convenient to consume. 2. Fruits and veggies in dehydrated form to help you hit your 10 a day. For those of you who say hitting your daily fruit and veggie quota is hard because you don’t have time to peel and chop, there are a number of companies that won’t let you get away with that excuse any longer! 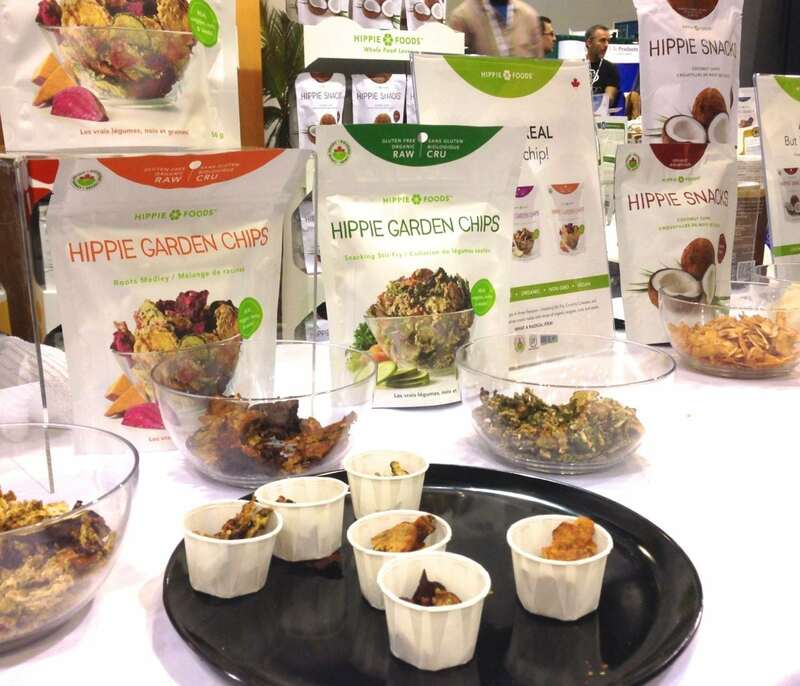 There were seaweed crisps and kale chips of all forms and flavours at the expo, but one of my favourite, more unique finds was the new Garden Chips from Hippie Foods. You may already know this brand because of their very popular coconut chips, but the veggie junkie in me really enjoyed the Snacking Stir Fry blend of Garden Chips. 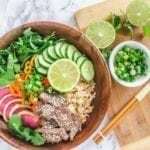 organic zucchini, organic sunflower seeds, organic carrots, organic almonds, organic kale , organic red cabbage, organic tamari soy sauce, organic onions, water, organic agave syrup, organic sesame seeds and organic chia seeds. 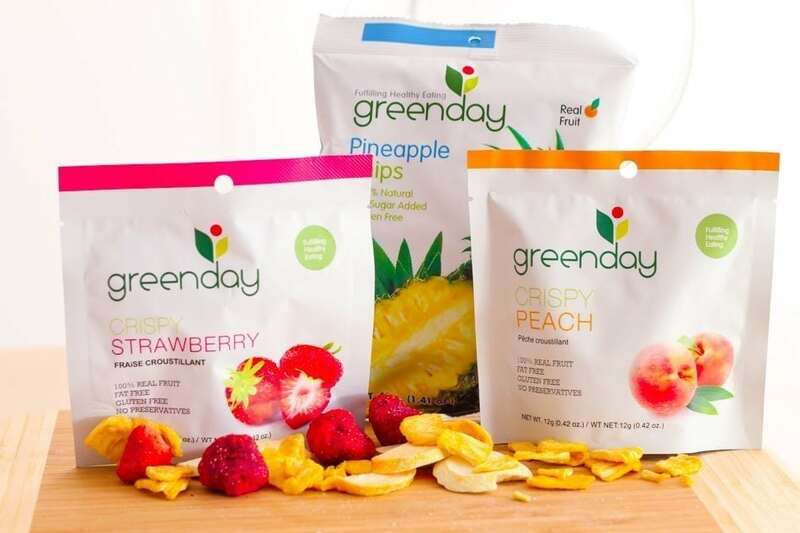 I really liked their pineapple chips for their sweet taste and crispiness, and think they’d be a really good addition to a homemade trail mix (the kind you smuggle into the movie theatre.. or is that just me?). They’re pretty kid-friendly too and a good substitute for some of the fake fruit snacks on conventional grocery store shelves. 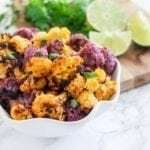 I’ll always be an advocate of whole foods first (as in, without the dehydration, the way they fell from the tree/sprouted out of the ground), but all these dehydrated fruits and veggies do add convenience for those looking for healthy on-the-go choices. They’re good substitutes for greasy potato chips and many contain organic ingredients which is another big plus. … which totally changed my mind. Feeding Change is a company with an awesome vision, and some pretty awesome raw, non-GMO and organic products too. At the show they had virgin coconut oil, coconut water, coconut meat, and for those of you who love the ‘roons, chocolate macaroons. (I had one and I don’t even like macaroons.. or so I thought. These were awesome.) 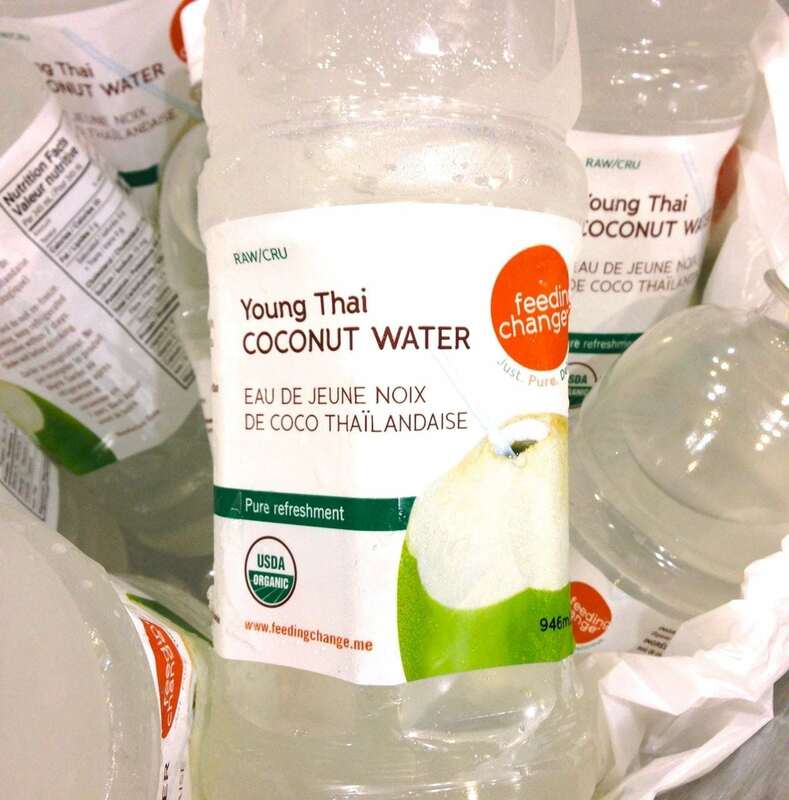 This particular coconut water is unpasteurized with no added sugars or preservatives. Ice-cold, it was delicious. Until the tradeshow, all coconut waters I’d ever seen were in cartons or bottles, ready to drink. 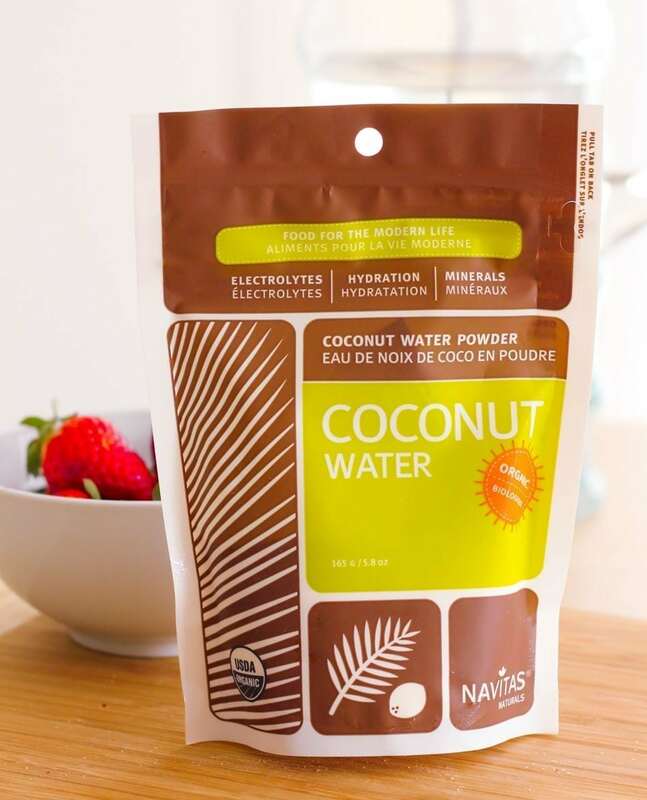 However, one unique find was Navitas Naturals’ powdered coconut water. Sounds kinda crazy right, powdered water? As you may have guessed, you need to mix it with water, but I suppose it would be a handy thing to have on hand while traveling if you can’t get cartons/bottles easily. It’s also a lot lighter to carry, and could me mixed into smoothies and sports drinks. 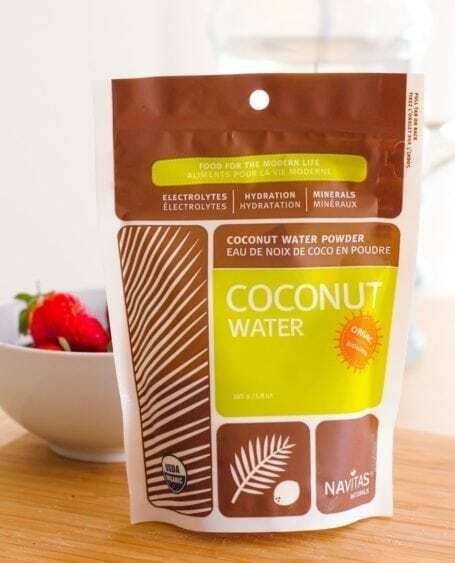 In addition to coconut water, there were a number of companies with tubs of coconut manna, which is the pureed meat of the coconut (not just the oil, which as the name implies is what’s in the jar of coconut oil in your kitchen or bathroom.) I had a taste of coconut manna on its own, and again, was surprised by how much I enjoyed it. 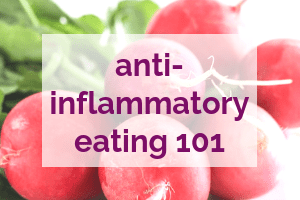 Watch for it popping up as an ingredient in curries, stir fries and dressings (it’s a good sauce thickener), desserts, bars, icing, and natural skincare products. When you think of your average bar, whether it’s a protein bar, granola bar, or other ‘snack’ type bar, is it sweet or savoury? My guess is that most of you would say sweet, and that’s what pops into my head too. Challenging this notion though, are savoury bars made by companies like Mediterra. 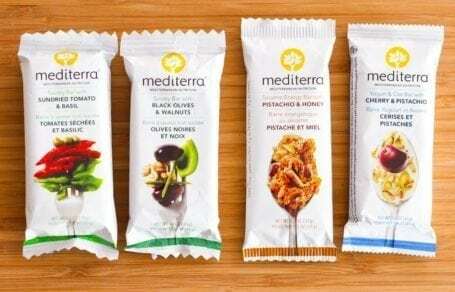 The inspiration for Mediterra’s bars comes from their Greek founder who wanted to incorporate some of the key components and staple foods from the Mediterranean diet into a convenient bar format. Two flavours (Sundried Tomato & Basil, and Olive & Walnuts) are savoury, whereas the other 4 in the product lineup are sweet. Regardless, all 6 are made with high-quality ingredients, no processed crap, and are non GMO and gluten-free. While the convenience factor is obvious, I can also see these being considered by endurance athletes looking for an alternative to sugar-packed gels and bars that have been on the market for years. 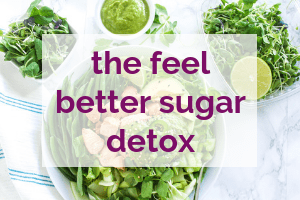 Yes, that sugar serves an important purpose from a performance perspective, but coming from someone who has been chugging back her fair share of sports drink throughout my half Ironman training, I would certainly welcome a savoury option once in a while! Aside from athletes, I think savoury bars can also benefit the general population by reducing our reliance on sugar. I don’t know about you, but I’ve found that the more sweet things I eat, the more I crave sweet things. Perhaps with more convenient savoury options on the market like these bars, as well as the dehydrated veggie chips mentioned previously, we’ll be able to reduce daily sugar intake and also reduce the incidence of lifestyle-related diseases that go along with it. 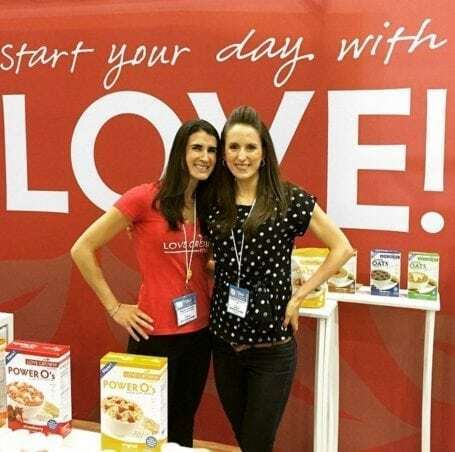 In addition to some new-to-me companies, I also had the chance to catch up with some of my long-time favourites like Maddy and Alex from Love Grown Foods. 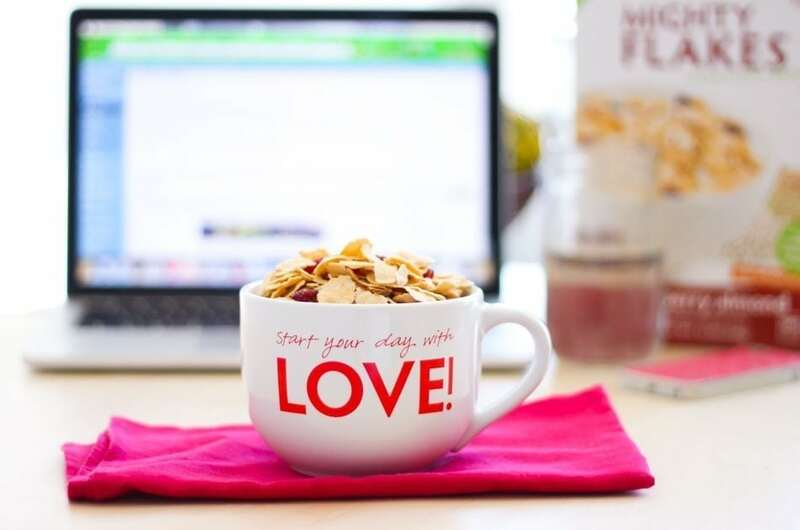 You may already know them for their granola, hot oats, Super Oats, and Power O’s, but they’ve just launched a wicked new product called Mighty Flakes. Like Power O’s, it uses their innovative bean blend (navy beans, lentils, and garbanzo beans) as well as brown and white rice to create a flaked cereal that’s similar texture-wise to the Frosted Flakes I remember from my childhood – only a squillion times better from a health perspective. They’re wheat and corn-free meaning that I’m able to tolerate them with my gluten sensitivity, and have been loving the Cranberry Almond flavoured ones as a pre-workout snack. If you’ve got little kiddies at home, I’m pretty sure they wouldn’t mind this in their breakfast bowls every morning! Nature’s Path is another cereal brand that’s extending their product lines, adding bars to the mix for Qi’a and Love Crunch, two of their existing cereals. 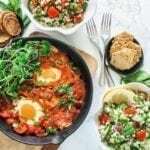 Like many other companies at CHFA that are already in the breakfast category, moving into bars creates an opportunity for these brands to be part of your life a little later in the day as well. 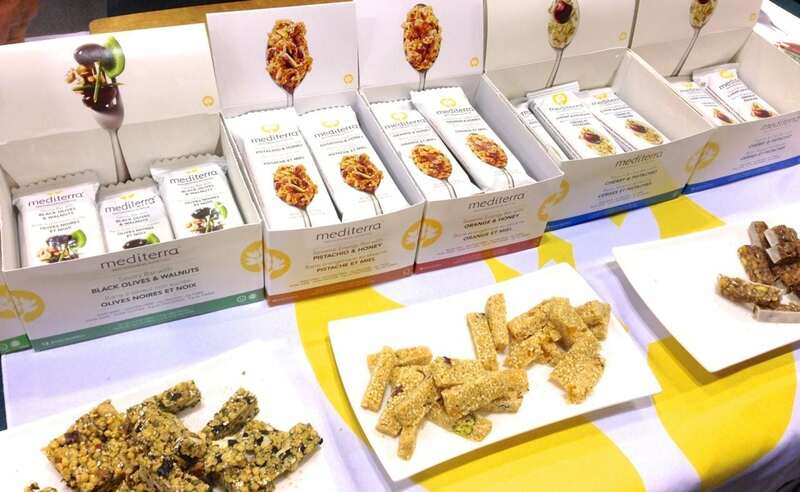 And like I mentioned above in trend #1, Nature’s Path’s Qi’a bars are another example of a company making superfoods (chia, hemp and buckwheat in this case) more accessible and convenient to consume. 6. Natural skincare that looks pretty, smells great, and actually works! Admittedly, food items are the ones that draw my eye most at events like this. 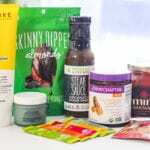 But in between bites of kale chips and swigs of kombucha, there were a few natural skincare companies that caught my attention. It was a combination of beautiful packaging, clever branding (yes, the marketer in me loves this kind of stuff), and high quality yet simple products. I’ve experimented with making my own body scrubs in the past, but when it comes to things like deodorant, I tend to buy the same traditional (read: the kind with all the supposedly horrible ingredients inside) sticks every time. Maybe it’s because I’ve always figured any sort of natural alternative wouldn’t be powerful enough to mask the lovely odour that wafts from my armpits after a long workout? 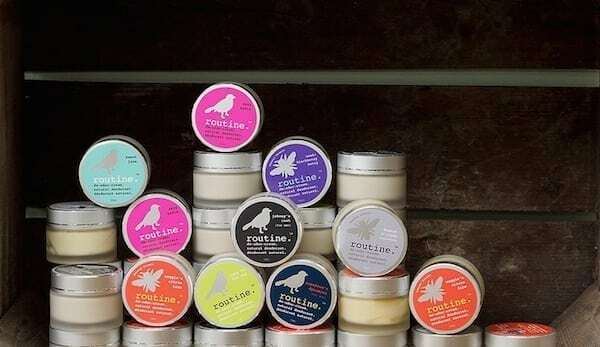 Whatever the reason, I came across Routine at the tradeshow, a Calgary-based company with the prettiest deodorant I’ve ever seen. Routine’s product line consists of 11 deodorants (some of which are vegan-friendly), but all of which are made without nasty chemicals. 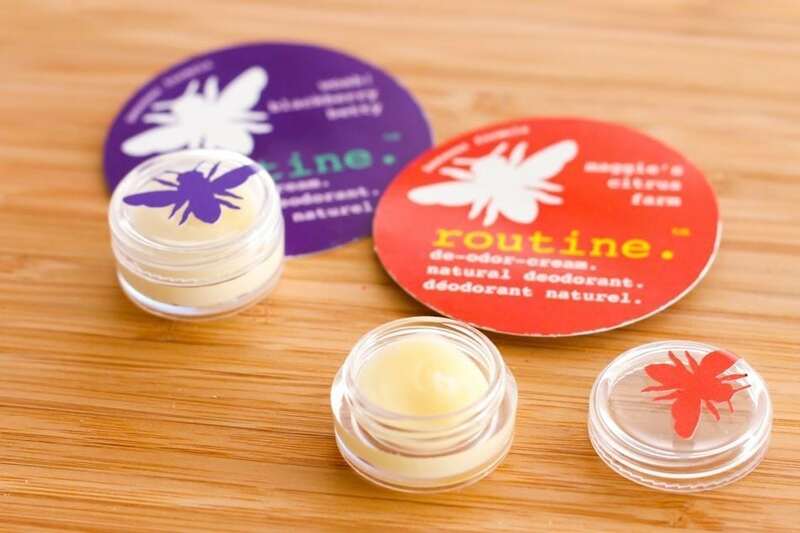 Each deodorant is scented with essential oils, and the ingredients are safe enough to eat (although eating deodorant seems like a rather unusual snack choice.) I was given a few samples – Maggie’s Citrus Farm and Blackberry Betty – and put the latter to the test this weekend. After 2 hours and 45 minutes on the bike, plus a 35 minute run, I did the old nose-to-pit test and guess what? I still smelled like blackberries! Each full-size pot is 50mL but lasts 3-6 months with regular use, so a little goes a long way. 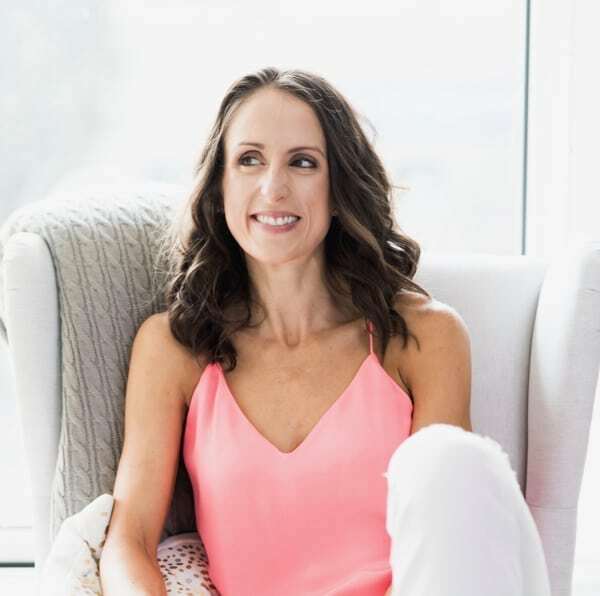 While the price point of natural skincare products still tends to be on the high end compared to the conventional alternatives, I like seeing new businesses come up with gorgeous products like Routine’s that really work. As more research is done on the effects of chemicals in the products we use daily, I’d like to think people will be willing to pay a little extra, knowing they’re doing what’s best for their health. 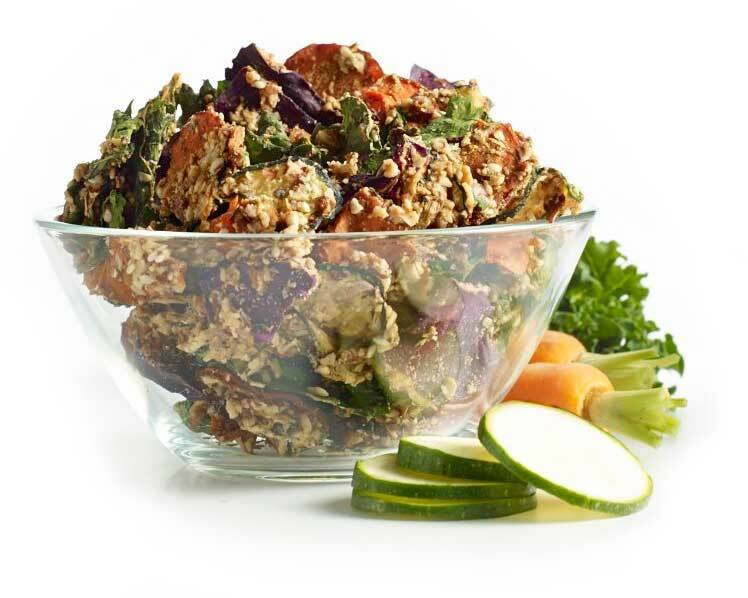 Dehydrated veggies, savoury bars, coconut everything…. 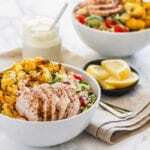 what food trends are you loving right now and which ones do you wish the world would just get over? 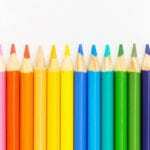 Have you come across any especially innovative products lately? Are there any ingredients that you see popping up everywhere that you wish you knew more about? Disclosure: All thoughts and opinions expressed here are my own, and no compensation was provided by any of the companies mentioned in this post. Wow this trade show looks like fun! I am way ready for savory snack bars. You are right they are all SO sweet. KindBars have some savory but I don’t see them everywhere yet. I had a bar last week and almost choked on how sweet it was. I used to love that bar! That deodorant sounds totally awesome. I made my own last year and it mostly worked, I’ll have to check out the company. Thanks! I haven’t seen Kind’s savoury bars yet either (although they could have very well been at the tradeshow – there was just so much going on!) but I’ll watch for them. Thanks so much for letting me know! Isn’t it funny how quickly we get used to lower amounts of sugar? I remember having the same sort of experience with a few bars I hadn’t eaten for a while. Let me know if you try Routine out. If you like fruity scents, I definitely recommend the blackberry and citrus ones! Fun stiff! I think I’d like the savory bars for a change. I’m looking forward to trying the savory bars, as well. I will oftentimes grab a bar for a quick b-fast option as I’m heading out the door, & my stomach isn’t always ready for that much sweet that early in the morning. YAY coconut everything!! Sounds delicious!! We love our “Big Name” healthy granola brands such as Love Grown and Nature’s Path who are doing innovative stuff but don’t forget about the little guys – Stephano’s has been making healthy granola since the late 70’s (before it was trendy) and have had a brand resurgence this year with the introduction of the Stephano’s Secret Stash line…good stuff, check it out! Thanks Noah – I’ll check it out!